In the leap from making things for myself to making things for sale, it’s tricky to balance things I find esthetically pleasing and what other people want to buy. 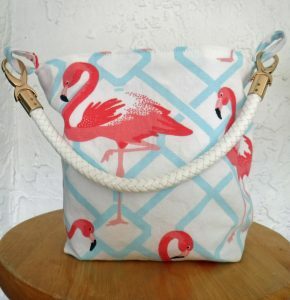 With that in mind, now in the shop are a small flamingo handbag — possibly the smallest I’ve made — which counters the large beach bags I opened the shop with. 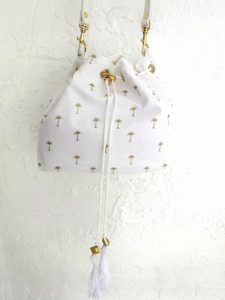 The cross-body bag has been popular for a while, and why not? Strap a bag on one shoulder and it’s bound to slip off. Put it across your body, though, and it stays close without swinging around. Also, bucket bags have been popular, too. 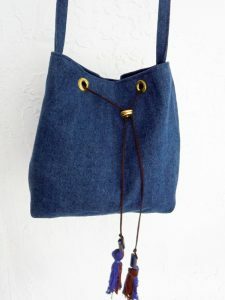 The denim bag is kind of a departure from the beachy/tropical style I’ve been making, but denim is a classic and seems perfect for fall. Also, it goes back to that idea of balance. What do you find yourself balancing these days?